Bidda was the first part of Doha to be founded, and was later absorbed into the larger town of Doha, which originally began as a separate settlement. The first possible mention of Bidda is in the records of the Carmelite Convent, which refers to a sheikh and fortress at “Bide”. Mentioned after Zubara in a list of place names going round the coast of Qatar, it is in the correct position to refer to Bidda. Billecocq, X.B. (2010) Le Qatar Et Les Francais. Paris: Collections Relations Internationales & Culture. Carsten Niebuhr, the sole survivor of an ill-fated six year journey across the Middle East, was one of the first western explorers to visit the Arabian peninsula. Niebuhr’s map of the Gulf produced in 1765 shows the towns of “Huale” (Huwaila) “Yusofie” (Yusufiya) and “Faraha” (Freiha), “Adsjar” (possibly al Khor) as well as “Gattar” (probably Bidda). However, the area of Qatar is not accurately portrayed and the sites are in the wrong order on the coast. It is thought that Niebuhr did not visit Qatar but based his map on second-hand information from local Arabs and English sea captains. Carter, R. (2012) Sea of Pearls. Seven Thousand Years of the Industry that Shaped the Gulf. London: Arabian Publishing. David Seton, the British representative in Muscat from 1800-1809, sailed to Bidda with the ruler of Oman, and provided the first description of the town and its defences. On the Northern hillock is a fortified House with a Wall and Square tower, in the Valley a breast Work with two Guns, and on the southern hillock two large huts with some kind of defence, and half a Mile to the Southward near the ridge is another Square building with a flag staff, under the Northern hillock is a sandy beach on which two Buglas, one Dow & one Botella [all kinds of boats] were drawn up with a breast work of Stones. The town had recently been settled by members of the Sudan tribe [Al-Suwaidi], originally from Abu Dhabi and Oman, whom Seton considered to be pirates. He attempted to attack Bidda but found that the water was too shallow to bring his warship close enough to bombard the town. He gave up and returned to Muscat. When the British naval surveyor Lt. R.H. Colebrook visited in 1820, the town had been largely abandoned, but he made it clear that it had previously been much larger. Guttur – Or UlBudee [Al-Bidda], once a considerable town, is protected by two square Ghurries [forts] near the sea shore; but containing no fresh water they are incapable of defense except against sudden incursions of Bedouins, another Ghurry is situated two miles inland and has fresh water with it. This could contain two hundred men. There are remaining at UlBudee about 250 men, but the original inhabitants, who may be expected to return from Bahrein, will augment them to 900 or 1,000 men, and if the Doasir [Dawasir, i.e. Al-Dosari] tribe, who frequent the place as divers, again settle in it, from 600 to 800 men. In early 1820 Bidda was the only port in Qatar from which trading vessels regularly sailed. Although Bidda was a focal point in the region, when the General Treaty of Peace was signed in January 1820 between the British East India Company and all the chiefs of the Trucial States (now the UAE, then including Abu Dhabi, Dubai, Sharjah, Ajman, Umm al-Qawain and Ras al-Khaimah). Qatar was not a signatory. The British authorities in the Gulf therefore did not ask Qatar to fly the prescribed Trucial flag. Bidda was in the limelight again in 1821, when the British East India Company’s brig Vestal bombarded and destroyed the town as punishment for a perceived violation of the peace at sea. The fact that no-one at Bidda had signed up to the maritime treaty and indeed had no idea why they were being punished, did not matter to the British, who considered themselves protectors of those who had suffered the violation. The bombardment forced three or four hundred of the inhabitants to quit the town and take shelter temporarily on the islands between Qatar and Abu Dhabi. In January 1823, during an exploratory voyage along the Arabian coast, Captain John MacLeod, the Political Resident in the Gulf (December 1822 to September 1823), paid a visit to Bidda. MacLeod met Sheikh Buhur bin Jubrun, the chief of the Al Bu ‘Ainain tribe and observed that Bidda was the only port featuring a substantial number of trading vessels at the time. By this time Doha had been founded a little distance from Bidda, and can be seen as a separate settlement on a map of 1823 (see below). Tradition holds that Doha was founded by the Al Bu ‘Ainain, so Buhur bin Jubrun can probably be considered the founder of the new town. It is interesting that McLeod refers to meeting him at Bidda rather than Doha. This is because for some decades observers tended to conflate Bidda and Doha’ due to their close proximity (just over 1 km apart) and referred to both as Bidda, even before they had grown together into a single town. It also seems likely that at this time the Al Bu ‘Ainain were more powerful than the Sudan and Buhur bin Jubrun was regarded as the ruler of both towns. The twin towns of Doha and Bidda, were mapped for the first time by Lieutenants Guy and Brucks of the Bombay Marine in 1823. A remarkable sketch of Doha and Bidda viewed from the sea was added to the map by Houghton and Powell. Later, Brucks provided a written description. Al Bidder Town is situated at the bottom of a harbour, formed by the reefs before mentioned…. This place contains four hundred Arabs of the Nahune (Na’im), Dooasir (Dawasir), and Abookara (Al Bu Kuwara) Tribes, and is frequented by the Monasir (Manasir) and other wandering tribes. In the pearl season the inhabitants are augmented to about twelve hundred, it being convenient to the banks, and so completely sheltered. The people are mostly fishermen; they have one or two trading boats, and, like all the other inhabitants of this coast, take a large share of the pearl fishery. They are subject to Bahrain. Cattle and poultry are procurable here, but they are very dear. Water, pretty good, can also be procured. The defences are a small Ghuree [fort] in the town, two or three towers, indifferent, and a Ghuree a mile to the north-westward of the town, on the rising ground. Regarding the population it is likely that Brucks is referring to adult men only, but even so it is clear that the town was still small. Although Brucks evidently saw and mapped the two separate components (Bidda and Doha), he still referred to them under the single name of Bidda. Note too that the Sheikh of Bahrain was considered to the overall ruler of the Bidda at this time. Brucks, G.B. 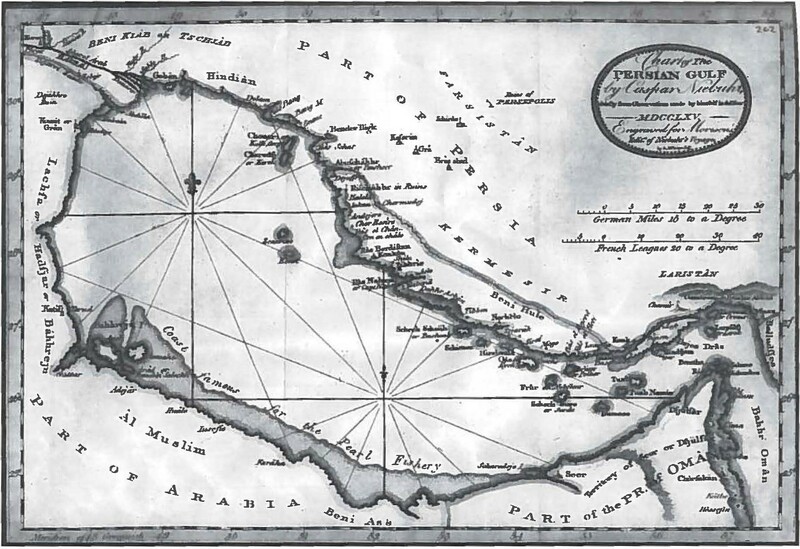 (1829) Memoir descriptive of the Navigation of the Gulf of Persia in R.H. Thomas (ed) Selections from the records of the Bombay Government No XXIV (1985) New York: Oleander press. In 1828 the Sheikh of Bahrain imprisoned the most important man in Doha, Muhammad bin Khamis of the Al Bu ‘Ainain tribe (who had succeeded Buhur bin Jubran) for having killed a resident of Bahrain. The resulting conflict caused the ruler of Bahrain to destroy the Al Bu Aynayn fort in Doha and evict the tribe, settling its members in the villages of Fuwairit and Ruwais. Clearly Bahrain was still able to enforce its rule over Qatar at this time. Later maps and descriptions do not show a fort in Doha but refer to a large round tower with flagstaff at the sheikh’s house. This was perhaps the surviving round corner-tower of the fort depicted by Houghton and Powell on Guy and Brucks’ map. In the absence of an effective chief on the Qatar coast, Bidda became a sanctuary for foreign outlaws, forcing Britain to intervene. In November 1839 an outlaw from Abu Dhabi, Ghuleta, took shelter at Bidda. A.H. Nott, Commander of the Clive, came to Bidda and demanded that Salemin bin Nasir al-Suwaidi, the chief of the Sudan tribe at Bidda, surrender Ghuleta. Al-Suwaidi obliged and also arrested the pirate Jasim bin Jabir Raqraqi, along with his associates when they attacked a boat from Ras al-Khaimah which had arrived at Bidda. In 1841, Doha was again subjected to bombardment by British ships, on account of Salemin bin Nasir al-Suwaidi being unwilling or unable to pay a fine of 300 dollars for the piracies previously conducted by Jassim bin Jabir Raqraqi. After the British took a few shots at his fort, Al-Suwaidi came forward with the fine. He could not pay entirely in cash so offered, amongst other items, 42 silver bracelets, one sword, one silver hair ornament, four pairs (gold) earrings, two daggers, nine bead necklaces and two silver ear-rings to supplement the money available. Thus the sheikh’s family and the women of the Sudan tribe paid for the misdeeds of Raqraqi. Isa bin Tarif, head of the powerful Al Bin Ali tribe and former sheikh of Huwailah, once the most important town in Qatar, Huwailah, moved to Bidda and Doha in May 1843. He forced the (evidently bankrupt) Sudan to leave Bidda (they later returned) and installed his relatives and allies, including members of the Ma’adhid (to whom the Al Thani family belong), and the Al Bu Kuwara. The Al Bu ‘Ainain returned from exile, but to Wakra rather than Doha, where they stayed until their final departure to Jubayl, Saudi Arabia, in 1909. At this time Isa Bin Tarif was still loyal to Bahrain, but had begun to meddle in its politics. In 1847, Isa Bin Tarif grew increasingly suspicious of the new ruler of Bahrain, Sheikh Mohammed bin Khalifa, who was manoeuvring on the north-west coast of Qatar. Bin Tarif changed allegiance to support the old ruler of Bahrain, Sheikh Abdullah, whom he had previously helped to depose. In November 1847, he led a coalition consisting of around 600 men to Umm Suwayyah (near Al Khor), where they met the Bahraini troops commanded by Sheikh Mohammad bin Khalifa. A battle was fought on 17th November, in which Bin Tarif and 80 of his men were killed, and the coalition of Qatari tribes defeated. Some say that the battle took place at Fuwairit rather than Umm Suwayyah. Well done research! It must have been difficult to differentiate between Doha and Bidda in historical records.